Did you find yourself fishless and frustrated the last time you were on the water? Have you been disappointed in your ability to find the biting fish? As with real estate, the three most important considerations when fishing are location, location, location. Success is often a matter of finding fish. To help towards this end, it may be time to look into a getting a fish finder. Fish finders help anglers position themselves over fish-holding structure and schools of baitfish. GPS features allow the anglers to mark hot spots to return to again and again. 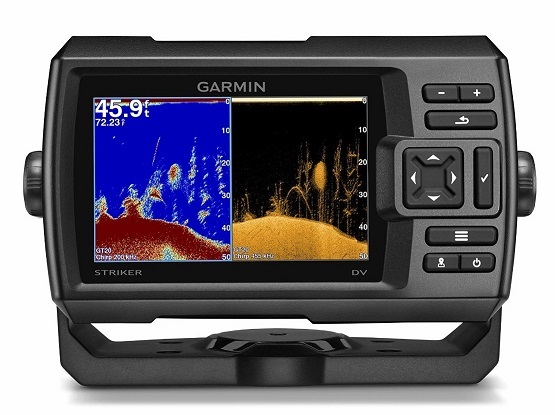 Read on to learn about the great fish finder, the Garmin Striker 5DV review. The Striker 5DV features a 5-inch color display screen with a backlight. The high resolution screen is visible in all outdoor light conditions. The display gives you a great sense of what’s happening beneath the surface. A split screen option allows for various viewing configurations. The viewing options include bottom imaging, flasher, and GPS. The included transducer sends a continuous stream of frequencies using CHIRP and Down-Vu scanning. As a result, the screen provides detailed pictures of the bottom. Distinct, high-resolution images of fish and fish-holding structure are also visible. Garmin offers upgrades to provide even greater detail. The Striker 5DV includes a built-in GPS. The GPS allows you to mark any fish-holding structure, saving productive waypoints. By saving a series of waypoints, you can plan your fishing in advance, heading to the most productive spots on the lake. The Garmin saves these waypoints in an alphabetical listing. One viewing option allows you to see your real-time current location relative to saved waypoints. Be sure to save the location of the boat ramp, especially on bigger bodies of water. As an added bonus, you can electronically share saved waypoints with other Garmin users. One of the more interesting features of the Striker 5DV is that it functions as a flasher. In place of using a separate flasher for vertical fishing presentations -- ice fishing or jigging over a school of fish -- you can switch to the sensitive flasher display. This display looks like the face of the classic Lowrance flasher. It indicates bottom type, depth, vegetation, and the depth of individual fish. Some anglers even monitor their lure or bait as it moves through the water column, noting the reaction of any marked fish. The Striker 5DV is a great fish finder that provides clear pictures of the bottom. Two additional transducers -- the GT22 or GT23, available as upgrades -- provide even higher resolution scans. This removes background signal noise, making false readings less likely. The result is more accurate displays, even at high boat speeds. The upgrades are particularly applicable for finding often overlooked structure and precision, high-speed trolling applications. The Garmin Striker 5DV fish finder is designed for both salt and fresh water fishing. Garmin claims accurate readings to 2,300 feet in fresh water. Due to its increased density, the 5DV reads to 1,100 feet in salt water. An optional, portable carrying case allows the fish finder to travel anywhere, including on the ice for ice fishing. The waterproof case holds a rechargeable battery. Floating transducer mounts are available for ice-fishing; fixed mounts are available for small watercraft, such as canoes, float tubes, and kayaks. On larger boats, you can mount the 5DV just about anywhere. A trolling motor mount is included. There are long lists of benefits to the Striker 5DV. 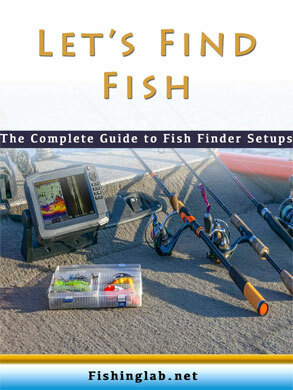 Most notably, this unit is relatively inexpensive, but offers many of the options found in a high-end fish finder. CHIRP technology provides a wealth of information, presented crisply on a color display. The 5DV unit can be used on a boat, or, with the flasher display and portable case, carried to the ice for a day of ice fishing. Marking productive waypoints speed up the process of finding the fish. If you so choose, sharing these points with other Garmin users would help with new bodies of water. There are a few drawbacks to the 5DV. The most notable drawback is that, as of this writing, Garmin has discontinued the model. Several users complained of the complicated set-up and lack of included directions. Another struggled to find the boat speed display setting. Included GPS for marking waypoints. CHIRP technology, clear imaging on 5”color display screen. ​Accurate readings to over 1000-foot-depths. ​Save waypoints and share with others. ​Flasher displays option for vertical fishing. ​Hardware to mount anywhere on your boat. ​Displays boat speed when using GPS feature. ​Optional portable carrying case for ice fishing. ​Optional upgrades for even clearer picture, even at high speeds. Does Garmin 5DV include a trolling motor mount? Does it display boat speed? Yes, it displays speed using data from the GPS receiver. Where do you get a manual? The manual is available online. There are also how-to videos on YouTube. The Garmin Striker 5DV is a versatile fish finder, suited to most fishing, including ice fishing, applications. I recommend it based on its entry-level price tag, a wealth of features and GPS technology. 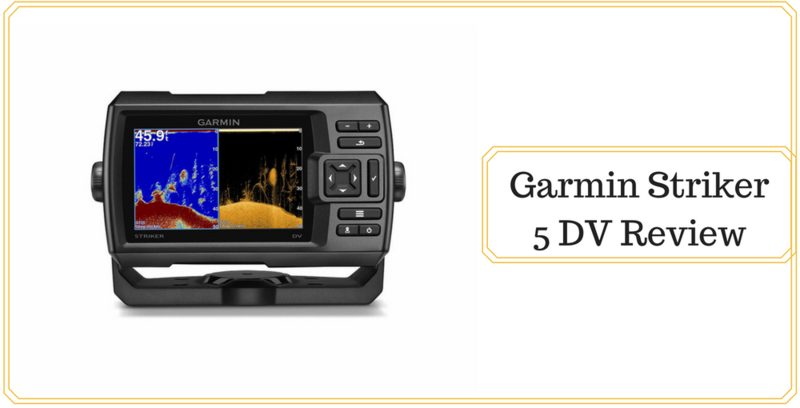 Available upgrades provide an even greater level of sophistication for serious anglers, making the Garmin 5DV comparable to many high-end units. I believe you'll find the combination of GPS technology, high resolution images and the ability to save and share waypoints, may make the 5DV the only fish finder you’ll ever need. I need a cover for my garmin striker dv 7″. How can I order one.